There are a lot of really nasty jobs out there: the fellow from the transportation department who scrapes road kill stuck to highways; Big guys who maneuver through mucky crawl spaces to clean up sewage spills; and my brother Michael, who spends 50 weeks of every year away from his family while he trains the police force in Afghanistan. But none of these professions can hold a candle to the granddaddy of nasty jobs: telemarketing. If I want something, I drive to the store, look at the clearly-marked price, then decide how badly I need it. I shop at places like Trader Joe’s and Costco, where I can ask the clerks where I can find the coconut milk or lima beans, and they won’t try to sell me a Buick. I can retain a feeling of power and superiority because I am in control of my destiny, or at least my own shopping choices. I avoid malls where toothy salespeople leap out from all directions and spritz me with cologne, or compliment my beauty and in the same sentence tell me that I should have a makeover. Really… how can I be both? But if I think the mall peddlers’ tactics are hard-sell, telemarketers make them look like pushovers. Granted, I know telemarketers are merely doing their job and trying to make an honest living. At least some of them may be honest. But just by calling me, I feel like it’s an unwanted invasion – bypassing the front door and sneaking in through the phone lines. I don’t seek telemarketers out. They seek me. They’re stalkers who know my name and phone number and want to smooth-talk me out of my credit card number. They are incredibly persuasive, and I am putty in their hands. My husband Tom has no problem dealing with telemarketers. I know he’s on the phone with one when the conversation consists of: “Hello?” Click. I’m not as tough as he is. I am a nice, polite person and I don’t want to hurt their feelings, even if they are calling from a warehouse in India but pretending to be down the street. I’d love to kiss the guy (or gal) who invented Caller ID. If I recognize the call, I pick up (except for my particularly chatty friends who are just going to move on to the next person anyway). If the number has a strange area code or literally “000-000-0000 NAME NOT FOUND,” the call goes to the machine, and the caller usually just hangs up. But Telemarketers have gotten wise to the Private Caller ploy, and they stealthfully slink in through that back door. I don’t like to answer Private Callers because they’re already paranoid by discretely protecting their anonymity, and my subliminal judgment of them is not going to convince them to crawl out from their hiding space. Yet it’s a bit of the pot calling the kettle black if I’m hiding from callers who are also hiding from me. My mother-in-law is a Private Caller, so I play a little game of Russian roulette when I cross my fingers and pick up the phone. About 95% of the time it’s the dreaded Telemarketer. I can already hear the theme from Jaws playing in my head: Da-dum. Da-dum-da-dum. The ironic thing is, last year we really did need to buy something and I thought it might be helpful to talk to one of these phone predators. We had a tarp the size of a football field on top of our house, which means we were in the market for a new roof. So when a telemarketer from a roofing company called, I decided to champ it out and hear his pitch. Me: “This is she.” (Two things – “Mrs. Flynn” was my grandmother who resembled Mrs. Santa Claus. “This is she” makes me sound so erudite, it’s hard to resist). Me: Uhhh… (Maybe this one will be “the one.”) We actually do need a quote for a new roof. Me: “Huh?” (So much for my erudite act). Telemarketer: “We need both you and your husband to be there when our contractor comes out. Since I kept my maiden name, and my husband isn’t one of those wimpy-boys who takes his wife’s name (no offense to the wimpy-boys who do that sort of thing), “Mr. Flynn” leaves my long-dead dad, or my brother Michael Flynn, who as I already mentioned, is in Afghanistan either getting heatstroke or frostbite, depending on the season. My answer? I told you I was polite. That was one hard-core telemarketer! Yikes! Another very entertaining blog. I too loathe and despise those blasted telemarketers, who are now calling me on my cell phone. Talk about adding insult to the proverbial injury. I’m with your husband. I just hang up. The best solution I every heard to do is, say, “one moment”, then hand the phone to your 2 year old. Or in your case, your 6 year old. Since he doesn’t like talking on the phone bribe him with a lollipop. Do they still have lollipops or is their an update on that name? Jake hates talking on the phone. The telemarketer would hand up due to boredom. I would love to know WHY they needed you both to be home! What if you weren’t married, or if there were two Mrs. Flynns? Then what? Would they not sell to you? Apparently they do their hard sell and don’t want either of us to have the excuse of “I can’t commit right now. I need tot talk to my husband/wife first. That was a good response to the telemarketers,they are really doing a good sales talk and they are really annoying on some part of the call. Just hang up on telemarketers. You’re not going to buy anythihng so you are waisting their time and your own by listening to them. The same is true for door-to-door sales men. Those guys get greeted by me and my two dogs, a German Shepherd and Australian Shepherd. The three of us are very convincing that we don’t want whatever they are selling. My favorite ones are the callers looking for a donation or vote. They ask for my wife. When I tell them that she is not in they hang up. What about me? don’t they want my money or vote? I’m really nice to telemarketers – they usually want to hang up on me. be back to read a lot more, Please do keep up the excellent b.
Wow! Finally I got a website from where I can in fact take useful facts regarding my study and knowledge. Actually no matter if someone doesn’t be aware of then its up to other visitors that they will help, so here it happens. 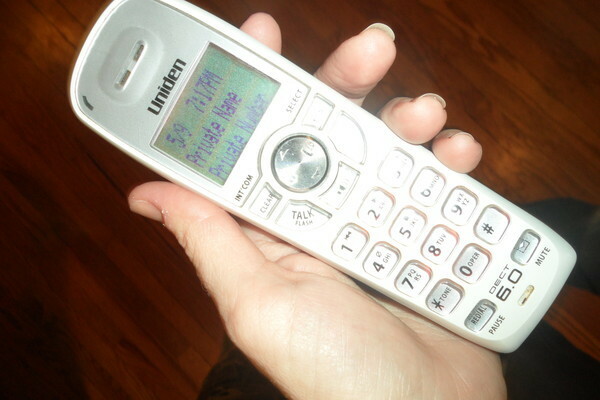 I do not leave a comment, however I browsed some of the remarks on Dodging the Telemarketers | very VERY busy mom. I do have some questions for you if you don’t mind. Is it simply me or do some of these comments appear like they are coming from brain dead people? 😛 And, if you are posting at other social sites, I’d like to follow everything fresh you have to post. of the greatest in its field. Great blog!